Notes: This anemone serves as a "host" for many types of Clownfish in the wild including: Amphiprion clarkii, A. sebae, A. akindynos, A. chrysogaster, A. chrysopterus, and A. polymnus. In the home aquarium, they can also serve as host for Amphiprion ocellaris, A. percula, and A. allardi. The Haddon's Carpet Anemone requires a tank with strong lighting and good water movement. The aquarium should have a variety of sandy and rocky locations as this animal oftentimes can move about and seek refuge in a place it prefers. This species of Haddon's Carpet Anemone prefers to bury its foot into the sandy bottom, and will oftentimes attach itself to the bottom of the aquarium glass, where its column is completely buried in the sand for protection. When first introducing this anemone into the display, it is best to try and dig out an area of the sand bed where you prefer it will reside, while decreasing the flow rate during this time so that its not blown around the display. Doing so will allow the anemone time to settle in and bury its foot completely into the sand bed. Once in place, carefully move some sandy substrate around the column and increase the flow rate back to the normal output. The Haddon's Carpet Anemone has a very potent sting and may harm corals and other anemones as it moves about the aquarium. It is not compatible with other anemones within a 12" diameter, so monitor it when it is first introduced into the tank. 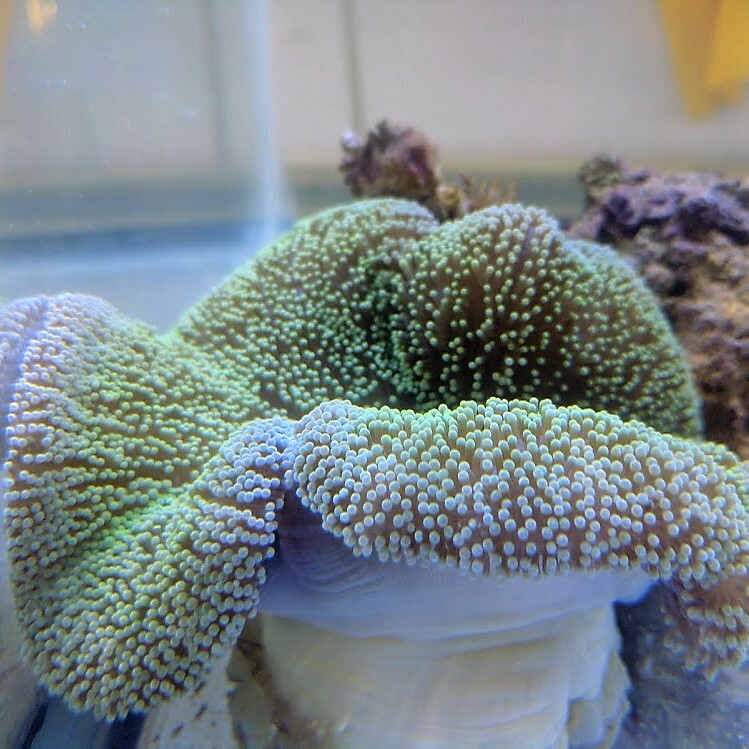 This species of Carpet Anemone can eat fish in the display aquarium so use caution when housing a Carpet Anemone in with fish other than clownfish. Although one of the easiest “Carpet Anemones” to care for this animal is still challenging, and is best left to the seasoned veteran aquarists. For proper care, a fully established aquarium, with perfect water chemistry, adequate flow and strong illumination, along with weekly or even daily feeding is needed. Ideal foods consist of chunks of fresh fish, uncooked shrimp, and other meaty marine foods. Q: where is it from amd how big is it? A: We get them from many different places, mostly Bali and Africa. They run from about 6" to 8" sometimes larger, but those are rare. They also come in different colors from tan, to green and bright green, some are striped some are solid. If your looking for a specific one just let us know and we can send you pictures of what is in stock.